Youth: Youth class is open to cosplayers twelve (12) years and younger only. Novice: Novice class is for beginner cosplayers, or cosplayers who do not have experience entering contests. Novice class entries have won no major awards. Novice class entries must have made or altered at least 50% of their costume. You are allowed to enter this class in a costume you did not make if the maker of the costume is present at the convention, a member of the convention, and can attend judging. Journeyman: Journeyman class is for cosplayers who have some experience. Cosplayers with at least 1 year experience entering contests or that have won at least one major award should compete in the Journeyman class. Journeyman class entries must have made or altered at least 50% of their costume. You are allowed to enter this class in a costume you did not make if the maker of the costume is present at the convention, a member of the convention, and can attend judging. 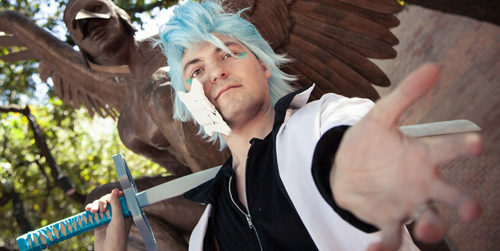 Masters: Masters Class is for advanced cosplayers or professionals. Cosplayers with at least 5 years’ experience entering contests or that have won at least three major awards should compete in the Masters class. Masters class entries must have made or altered at least 70% of their costume. You are allowed to enter this class in a costume you did not make if the maker of the costume is present at the convention, a member of the convention, and can attend judging. Walk-on cosplayers will have 30 seconds on stage to present their costume. Music will be provided by the convention. Walk-on participants must attend pre-judging in order to qualify. We strongly encourage contestants to bring reference images with them to pre-judging. Skits will have a 3 minute time limit that will start after set up. All skit entries are required to submit a copy of their script for pre-screening. You may either turn it in at the convention when you sign up, or contact the the cosplay director using our contact form. If your skit is dance or performance oriented, you are still required to submit a detailed choreography and stage direction write up. A link to a video of your group performing will also be accepted but must be submitted to the cosplay director no later than November 10, 2018. All skits are required to be pre-recorded. Audio will be turned in upon sign up in either MP3 or wav format. Skit entries may opt to participate in pre-judging for craftsmanship, but it is not required. We strongly encourage contestants to bring reference images with them to pre-judging. All entries must maintain a PG-13 rating. No excessive violence, sexual content, etc. This rule also applies to the costume itself; no over exposed individuals will be allowed on stage. The cosplay director reserves the right to turn away any entry they deem inappropriate. Nothing is to be left on the stage. Any props you bring onto stage with you must exit with you. You will also not be permitted to throw anything on stage or at the audience. Examples include props, glitter, petals, confetti, etc. For safety, any “battle” sequences or stunts are to be performed at 3/4 speed, and one foot must remain on the stage at all times (aka, no flips, tumbling, etc.). Only 8 people will be permitted on stage at a time. We strongly encourage costumes of Japanese origin. Examples include: Anime, Manga, Japanese video games, Japanese visual bands, etc. We do not, however, exclude costumes from other sources. That being said, you must be wearing a costume to participate in the cosplay contest. Contestants required to participate in pre-judging will sign up for a pre-judging time slot when they sign up for the cosplay contest. Pre-judging time slots will be assigned in 30 minute intervals. The contestant will arrive at the pre-judging room during their time slot and wait for their name to be called for pre-judging. Contestants will be given 3 minutes with the judges to speak about their costume. Groups of 3 or more will receive an additional 2 minutes. All pre-judging will take place on Saturday afternoon before the cosplay contest. If you are participating as a walk on you are required to participate in pre-judging. Skits have the option to participate but it is not mandatory. If your name is called during your time slot and you are not present we cannot guarantee you will be given an opportunity to make up the appointment so please be on time. If an emergency arises you can notify cosplay staff and they will attempt to assist you. Judges Awards: To be awarded to the entry the judge selects for any reason they see fit. Best in Class: To be awarded to the entry with the best performance and craftsmanship in their class. Best in Show: To be awarded to the entry with the overall best performance and craftsmanship.